Big Delicious Planet was the first caterer in the country to become a 4 Star Certified Green Restaurant. Our commitment to sustainability is part of the daily practices in our kitchen and at our events. Many years ago some our clients were beginning to ask us about our "green mission" and asking us to fill out green surveys. At the time, we had never taken a real hard look to evaluate what we were doing. We noticed caterers and restaurants were claiming to be "green," but we wondered, what exactly did that mean? How does a food service company actually prove they are "green"? There is so much waste in the food service industry - cardboard, cans, food scraps, water, disposables and energy. Every day we receive caseloads of food and product delivered to our kitchen, and by the end of the day we have broken down boxes, empty cans, and food scraps left. 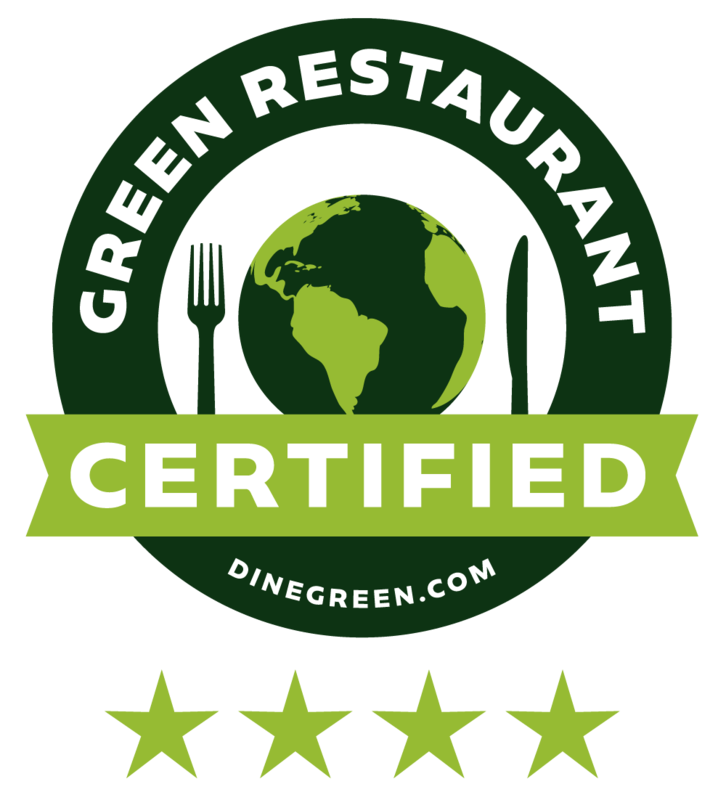 We knew we needed to find a better way to reduce our waste and the pollution we were creating, so we did some research and decided to have a third party analyze our environmental progress and become certification through The Green Restaurant Association. We submitted photographs every appliance, lightbulb, sink, aerator and piece of equipment in our kitchen, and scanned months of invoices from every vendor and utility company. In 2013, when the GRA notified us that we had received a 4 Star rating, the highest rating any catering company had ever received, we were thrilled and proud of our effort and the progress we had made. We're now 1 of 18 restaurants (the category includes caterers) in the United States who have truly gone beyond what food service companies would do. We know we aren't perfect, but we take "Greenest Caterer in America" seriously. We continue to work to stay on track, so we continue to train our staff to make our company greener. We have our own organic urban farm where we grow 41 varieties of vegetables, fruits, herbs and edible flowers. In 2017 we harvested close to 4,000 pounds of crops from our own farm, with our highest crop yield being tomatoes (610 pounds!!). We grow microgreens and herbs indoors year round. We're committed to saving the bees and eating a lot of raw, local honey - we have 3 of our own beehives! Our building uses sustainable geothermal energy for our water heater, heating and air conditioning. We compost all food scraps and compostable paper goods in our kitchen and Canteen. Our disposable goods are compostable: cups, deli containers, plates, cutlery, straws and napkins. We conserve water with faucets that have a lower water flow. Our toilets have dual handles. Our cleaning chemicals meet the highest green standards. We have a recycling system in place. We support farm-raised meat and ocean-friendly seafood. We have reduced the amount of paper we use by installing hand dryers in the restrooms. Since 2011 we have donated all our used vegetable oil to a biodiesel service, which turns it into fuel for vehicles and glycerin for soap for Loyola University. Since 2010 a local shelter picks up our excess food twice a week. We are members of or supporters of the organizations listed below.